This post is for those that have a decent understanding of f/stops and have used studio type strobes. If it's over your head, try to learn what you can from the post or ask questions using the comment section. The Profoto B2 Kit is the first image at the top left of this page and has a 9 stop range. The retail price is around 2K. The Paul C. Buff Einstein is pictured at the top right and also has a 9 stop range. The retail price is around $500. The AlienBee 400 is pictured at the lower left and has a 6 stop range. The retail price is around $225. 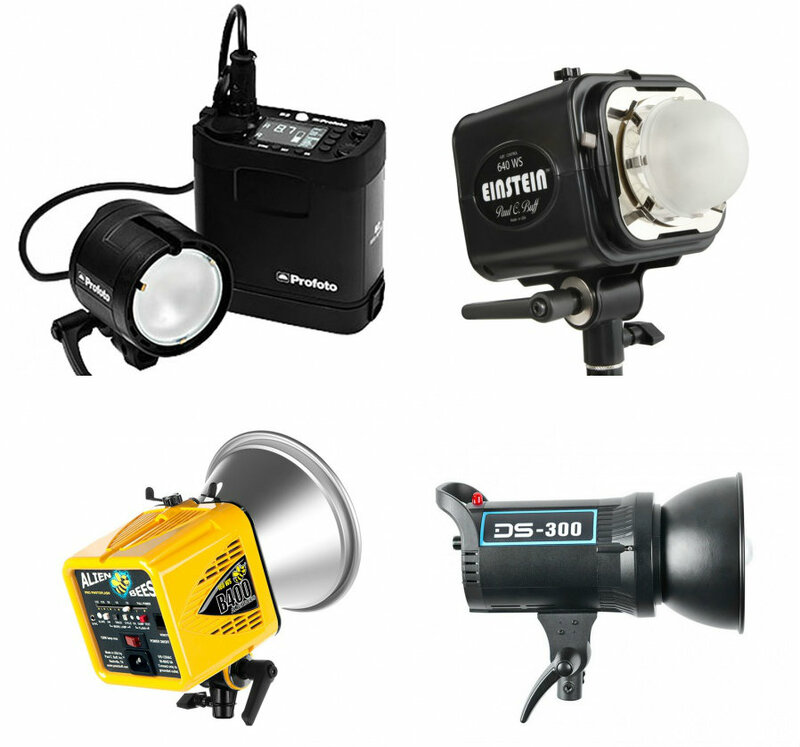 The final strobe pictured at the lower right is the Neewer (Goddox) DS-300 which has a 4 stop range. The retail price is around $110. I posted a graph to show how stop ranges work going from full power to the lowest power setting. Notice the difference in the two with 9 stop ranges, the one with a 6 stop range and the one with a 4 stop range. Stop ranges will allow you to keep your lighting closer to the subject while shooting more wide open on your lens, but closer to the subject even at a more stopped down f/stop helps create softer lighting. For example, if you want to shoot at f/2.8 for a more shallow depth of field, then being able to reduce your light power can be very beneficial for two reasons: 1) If you are in a tight space and cannot move your light further back 2) And speaking of moving your light further back which reduces the power by shear distance, it also creates a harder light source. The further away your light is from the subject the harder the light especially based on the size of a modifier like a 33 inch umbrella vs. a 7 foot umbrella. Another benefit of having the light closer to the subject is light fall off for creativity. Light fall off can be both good and bad, but having lights with a 9 stop range has it's advantages. The Paul C. Buff Einstein is the most affordable strobe light that I know of with a 9 stop range (but there could be others). If the $500 price point is still too much for you. You could go with the AlienBee B400 which is the lowest power baby sibling of the Einstein and has a 6 stop range from 160WS to 5WS (160, 80, 40, 20, 10, 5). At $225 retail, the AlienBee B400 is a better deal than the DS-300 unless you have to have that 300WS which honestly is likely rare pending what you shoot the most of. For example, for portrait work, 160WS should be plenty. The Neewer DS-300 will only go down to 37.5WS which means if the light is too bright on your subject that the only way to reduce the light output is to change your f/stop or move the light further from the subject. I can tell you from experience that I have RARELY need the full 640WS of the Einstein, but it makes a difference when I do need it. For most of my work 640WS is overkill especially for portrait work. The example above is based on the assumption that the 640WS Einstein is set at full power and 800 ISO in order to stop down to F/16 because the depth of field is necessary. I have been in this scenario for a group photo. Notice in the comparison above how ISO and power settings relate to each other. I have had to put the Einsteins (Yes, it was two for a particular shoot.) on FULL 640WS power on the inside at F/16 at 800ISO which is why I used it on the comparison above. Notice what happens to the ISO at F/16 at lower power settings. A 160WS strobe at the same distance and exact same setup as the 640WS strobe means that the ISO has to go from 800 to 3200 in order to get F/16. I much prefer shooting at 800 or less ISO when possible and not bumping to 3200. However, I rarely ever need 640WS. But I have it covered when I do need it. Rather than own a 640WS strobe, you could always rent something more powerful than what you own for the occasional shoot that you need the power. Whatever you do, don't keep shooting project after project with a high ISO like 3200+. If that's your ongoing strategy, you should buy strobes with more power unless your images are used so small the difference in noise at 800 and 3200 is not noticed. I hope that I have said something above that will help you in your photography career. Bottom line, buy the best gear you can afford without going into debt that fits your shooting needs. If you are doing portrait work, you likely don't need the 640WS Einsteins and the Neewer DS-300 will get you by for most of your needs if you need to stay within a budget. However, the 6 stop range of the AlienBee 400 is likely a better deal than the Neewer DS-300 for more creativity with the stop range it offers plus it's made in the USA. As for the Profoto B2 Kit, it is awesome for on the go work inside, outside, TTL and more, but it's not going to fit in everyone's budget.